Never in the past have I said, ¨I'll do this which is good; I'll not do that which is not¨. Petty pleasures delighted me and I kept going far away from You. O Creator of so many thousand beings! How long will it take to attain Your divine, glowing, radiant feet? Wife, children, relatives, friends and others – the bond of love in such acquired relationships lasts till we are with them. The Lord who completely consumed everything in the eight directions and above and below yet did not sever his bonds with His devotees. Seek His companionship. Wayward Kaliyuga recedes, eager devas enter, the great Krta yuga takes hold and happiness floods the world as the devotees of our cloud-hued, sea-hued Lord Krishna spread love and bliss everywhere, captivating the universe with their songs! He who personifies exalted goodness, higher than which there is naught; He who obliterates ignorance by bestowing good sense; He who is the Lord of the immortal divinities - unfettered by torment, worship His resplendent feet and arise, my heart! In Him, seek refuge, surrendering your all. Then, free of the ephemeral ties that keep you from Him, await the moment when you can cast off this mortal frame. Think of Him, the source of perpetual bliss. He is all manifest, infinite, indivisible - Narayana, the exalted one. Submit yourself to His enduring care. Vaikunta! Manivanna! My diminutive prankster! You permeate my entire being and I revel in the perpetual bliss enjoyed by the celestials. O creator with never diminishing powers! You obliterate the evil threatening your devotees and annihilate the evil-doers. I am determined to hold on to you. Accept me. Though I knew you not, you reached out and captivated me O Lord of serene Tiruvengadam, the conqueror of Lanka, the one who bears the bow, a single arrow from which pierced seven huge trees, O enchanting one, adorned with fresh basil! You are now so much a part of me that you can never sever our relationship! Can I ever let go of you, who are, have been, and ever will be, my father, mother, verily my very life! O Protector and Lord of the three worlds, unmindful of your infinite glory, bedecked in a garland of cool, fragrant basil, you have made yourself available for us in Tiruvengadam. Freedom from sorrow does He bestow - whose radiance is boundless, all pervading; who allows Himself to be mesmerised by the daughter of the Lotus; who, in His infinite knowledge, governs the universe - that supreme enchanter, Kannan, holding fast to whose feet I have become free of woe. If truth be told, lotuses cannot compare with Your eyes, Your feet, Your hands; the brightness of burnished, sterling gold cannot compare with the effulgence of Your heavenly form. Virtually all similes the world uses to glorify You pale before Your divine brilliance. With single-minded devotion, just hold Him in your heart, forget yourself and sing His praises. Yield not to pride nor shyness, nor delusion. For, He directs all actions and the results thereof - that sapphire-hued, red-eyed, adorable Lord of the celestials. He is so accessible to all - the Lord who has filled my soul with infinite bliss and my life with luminescence; the sapphire-hued, who is worshipped by all the celestial beings and sages is so simple and unsophisticated. Just seek refuge in Him with a heart free of desires, and He will dispel all your worries. Once there was just vacuum - no radiant divinities, nor earth, nor life, nor anything. Then He created the Creator, and the Heavens and Life. This source of all origin stands as Lord Adinatha amidst the majestic monuments of Tirukkurughur (Tirunagiri). When he is so easily available for worship, why seek succour elsewhere? Oh Lord of all Lords who are spoken of - Siva, Brahma and all others, what do they gain - those who talk deprecatingly of You? Let them behold you in the midst of the resplendent mansions of Tirukkurughur and be enlightened. You vanquish the wicked hordes who torment the devas. You torment the asuras with your fierce hostility. O Lord of fertile Tiruppulinkudi! The very essence of my life! Though I am wicked, won’t You summon me or visit me just once so that I too may embrace your tender feet, caressed by the incomparably beautiful Sridevi and Bhoodevi. Never are you alienated from your mate, O heron bound by immortal love! My Lord, resident of Tirumuzhikkalam, has forsaken me; what solace have I? Ask Him from me, "While I suffer Your rejection, You live amidst company; does this befit You?" Go, tell Him that it is unbecoming of Him. O swans with graceful gait! Having found a choice of food on the river bank, you are now readying for courtship. (Waiting for Him) I have wasted away and my garments hang limply, though my spirit has not forsaken the Lord of Tirumuzhikkalam. As Varaha, You retrieved the Earth to protect me. As Krishna, You hold sway over me forever. O Lord of Paradise! Lustrous sapphire-hued one! You reside in enchanting, lush cool, Sirivaramangal for perpetual worship by the populace there. The celestials delight in your gigantic form stretching up to the Heavens. Please appear before me so that I too may pay homage to You. Aravamuda, the Lord whose sweetness one never wearies of, I saw Your incomparably beautiful reclining form, fanned by the swaying, luxuriant paddy of Tirukkudandai (Kumbakonam). My entire being is suffused with love for You. You hold me in thrall, dissolving my very identity. Not manifesting Yourself, yet present everywhere are You, O invisible divine charmer of mine! O master of illusion, Aravamuda, you fill my heart and soul with sweetness. 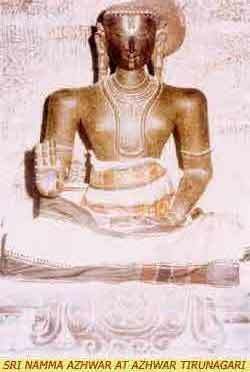 You subjugate me only to liberate me from sins eternal, O Lord of Tirukkudandai. Yet, despite submitting to You, will I ever cease to vacillate? As you stroll together with your gentle beloved, O dark coloured crane, behold, in tranquil Tiruvanvandur, resounding with Vedic scriptures, our Supreme Lord, the one who consumed all the worlds. Worship His feet and tell Him about my plight. When, oh, when will I become one with Your sacred feet, which Siva and Brahma worship! Are You the be all and end all of Creation, of whom was born and who pervades land, water, fire, air, sky, and indeed all life! Are You a playful prankster, who, as a cowherd, lifted a hill to shelter the cattle! Nobly shall they live with their families and children - those who master these ten of Kurukhur Satakopan's one thousand verses sung in praise of Kannan - the lotus-eyed Lord who fills the three worlds with goodness. * In decad 10, centum 8, Nammazhwar describes as incomparable and irreplaceable the joy of associating with ardent devotees of the Lord. My life melts like wax as I cry, my white bangle and waist band slip and fall, my bright eyes are filled with tears, there’s fear in my breast and my shoulders droop, worrying about You. O Manivanna! Your tender lotus feet are sore, yet You happily take the cows to graze. If asuras were to confront You suddenly, what would happen then?